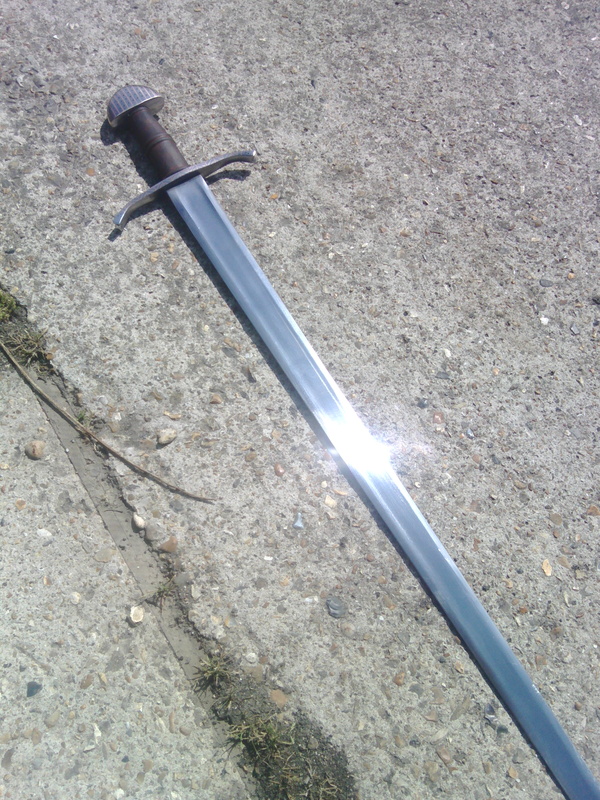 I study Highland Broadsword with my local HEMA group every week, and reading more Scottish and Irish history has made me want to have a go with one of the longaxes used before the Renaissance. 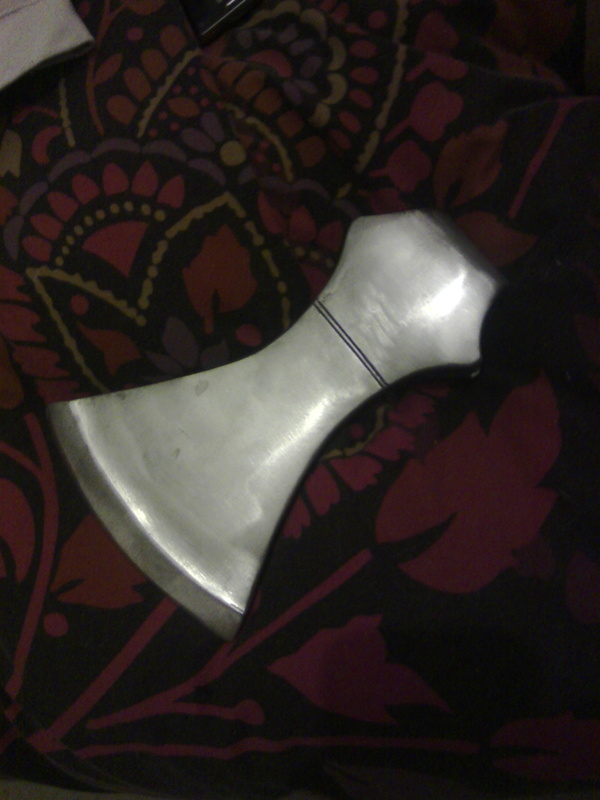 In addition I am thinking about joining the local Anglo-Saxon reenactment group, so a Daneaxe could also be applicable within that context if I one day rise to the giddy heights of being one of Haralds Huscarls! 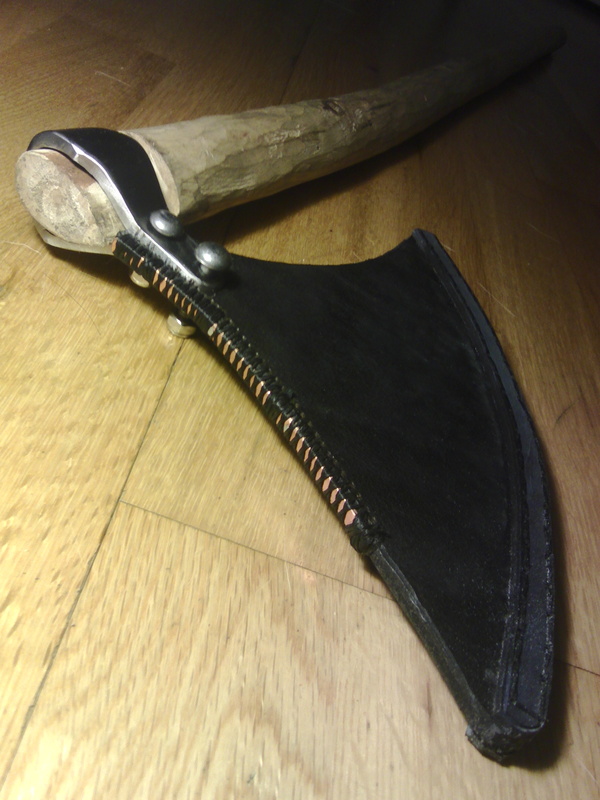 The axe is made of 6mm thick veg tan leather, with two strips of 4mm leather sewn onto the extreme edge. 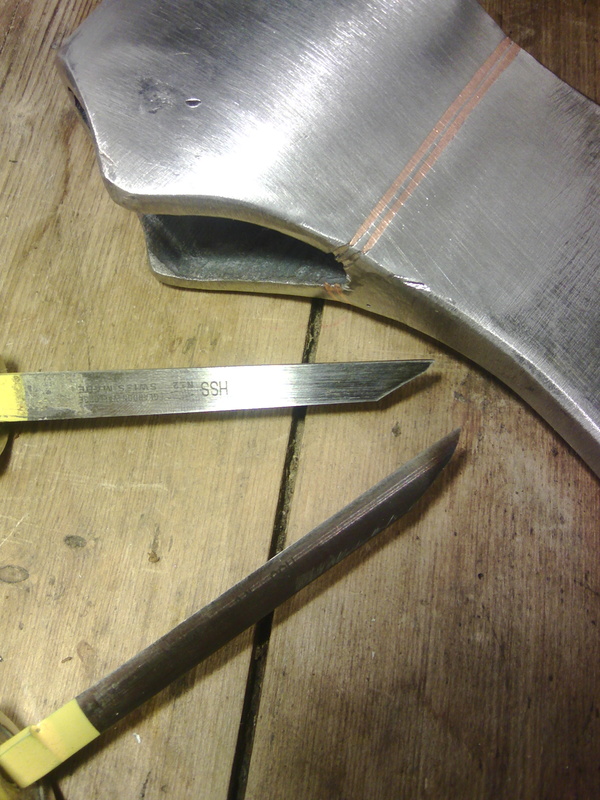 This is useful both for recalling the forge welded steel edge of the original axes, and thickens the edge diameter to spread the force of the axe strike to minimise the sting of a strike. 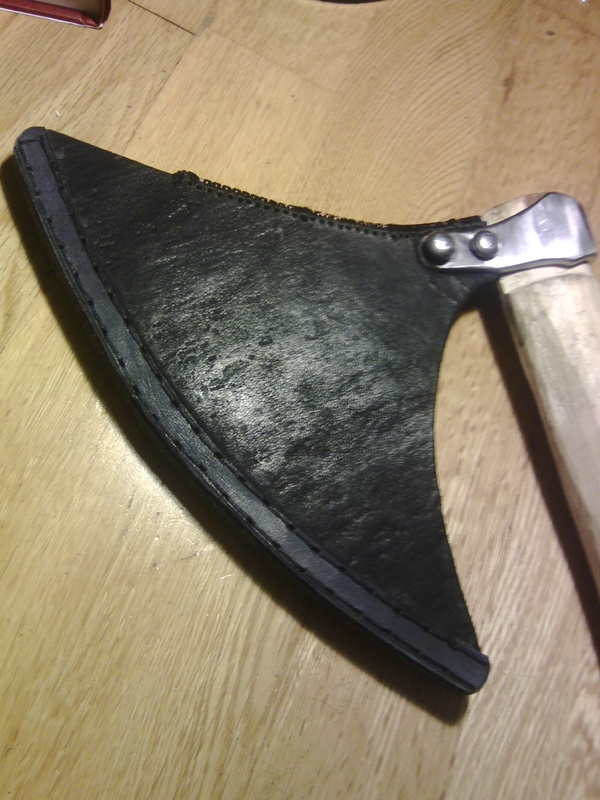 It also adds some stiffness to the edge which stops the axe from curling with use. 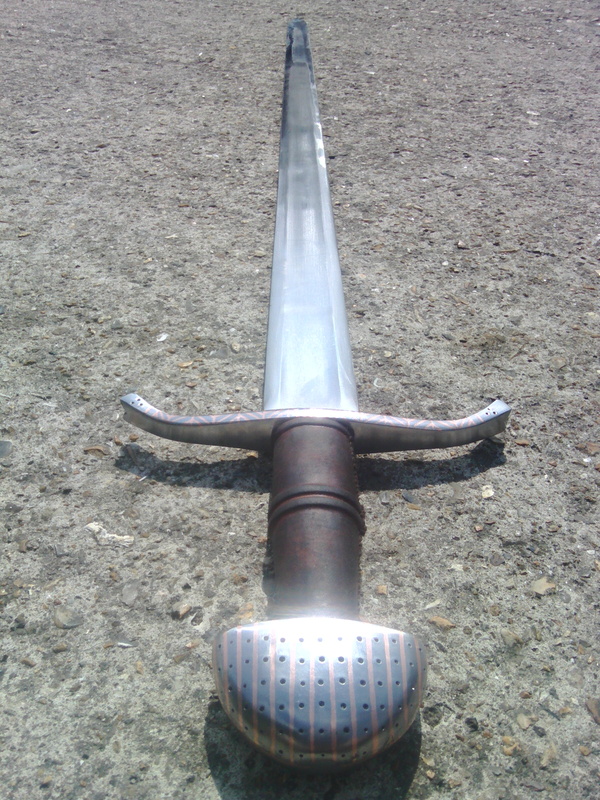 The body of the blade was water hardened then wax hardened to give it a bit of strength for when it hooks a sword blade and to help it keep its shape. 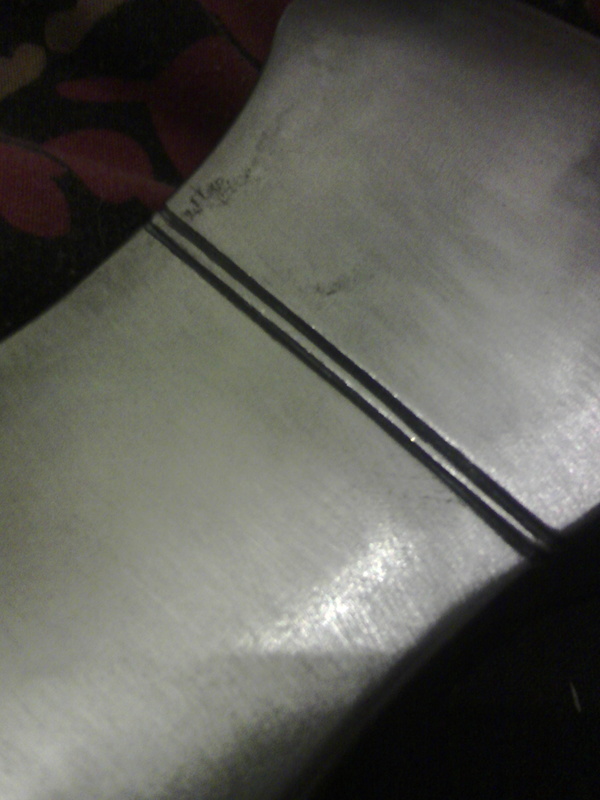 The edge is left soft to act as a cushion. 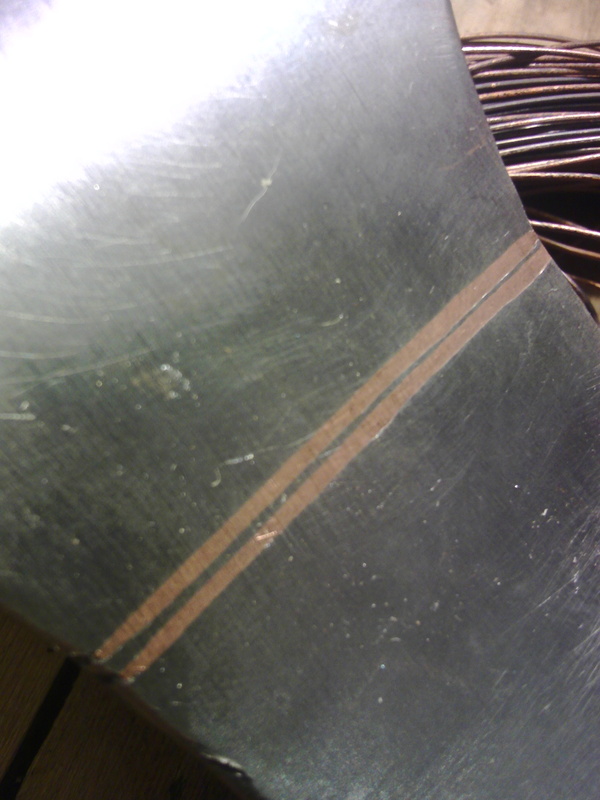 After the hardening, I found that the thin section where the blade passes into the steel was too weak and brittle from the water hardening so I pinned a strip of copper to the top, before binding it on with artificial sinew. 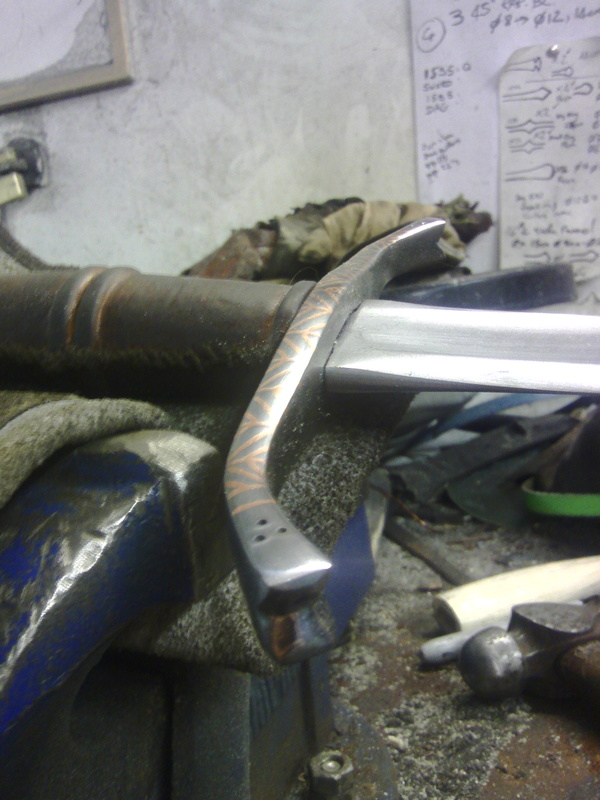 I think that it actually looks rather fetching, and I might put some inlay on the steel to complement it. 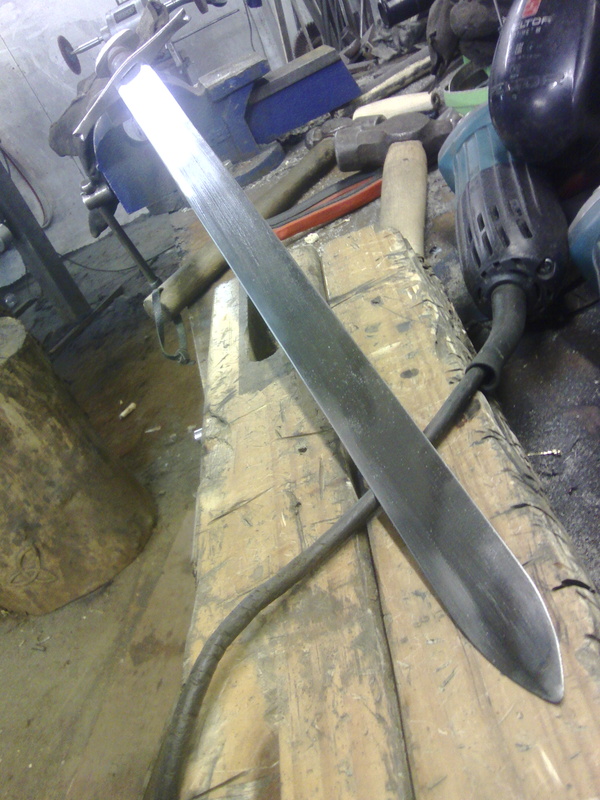 I still need to finish the haft, its 1m20 long, it needs tapering at the top to fit the head and some sanding to smooth it down. 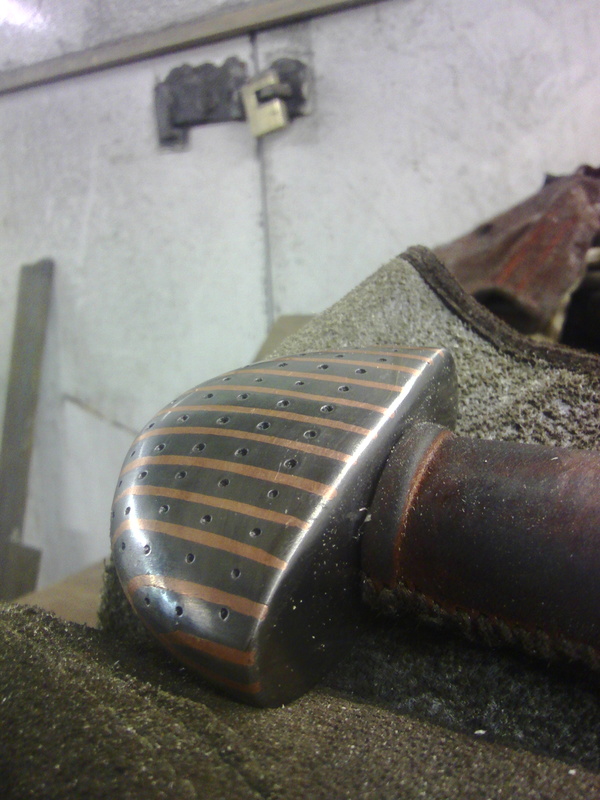 And it still needs rivets in place of the rather ugly bolts that are holding it together at the moment! 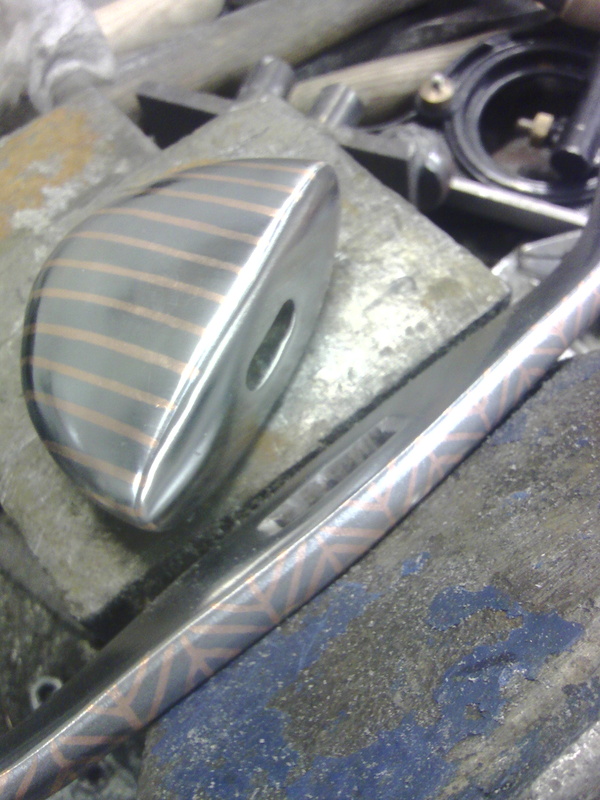 Cant wait to give it a go! 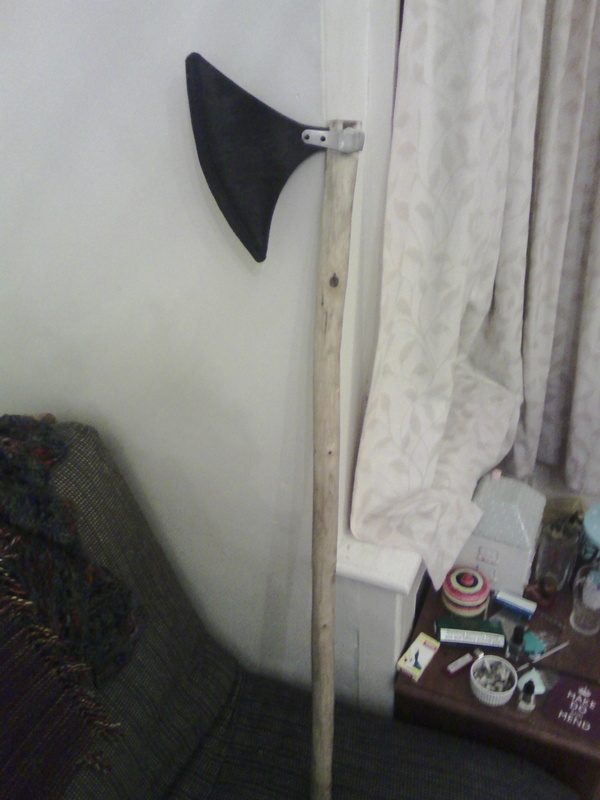 I have made some more progress on my stock removal axe. 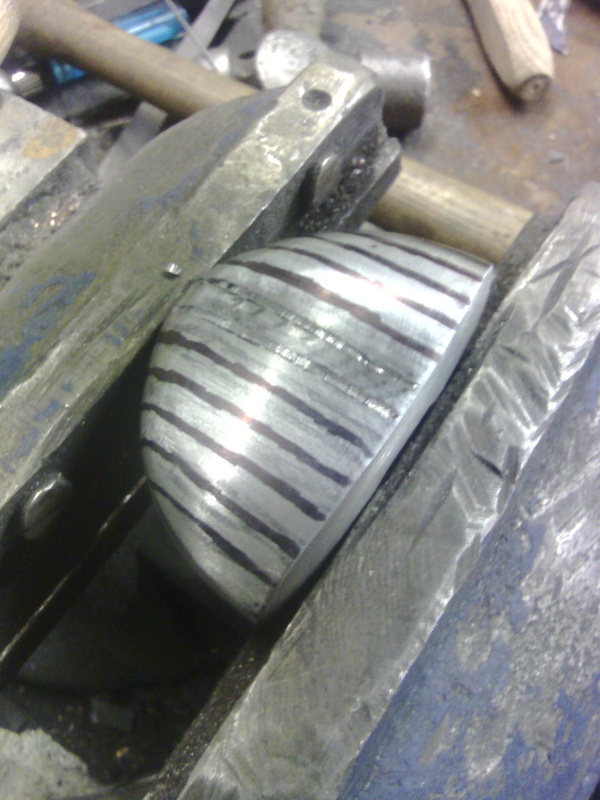 Most of the heavy grinding had been done so I heated the axehead in the forge to soften the steel before I started chiselling it. 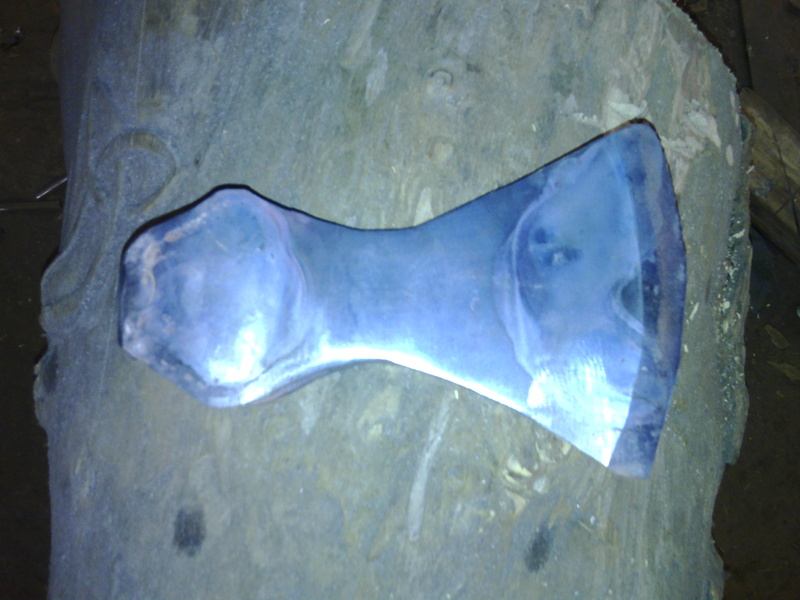 Here it is after the first round, under the camera flash the scale took on a lovely blue colour! 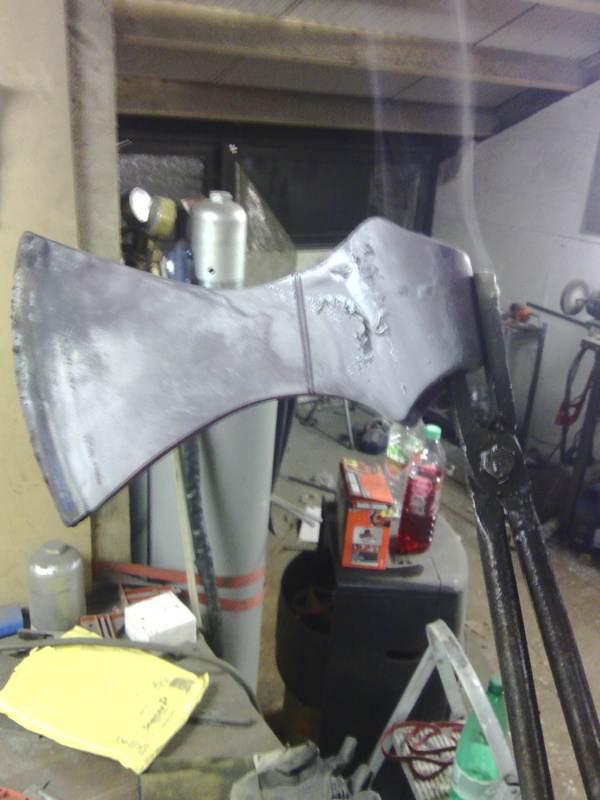 I was shocked to see the ghostly face in the blade, I wish the axe was closer to being finished as it would have been really cool to try to preserve the face in the final axe. 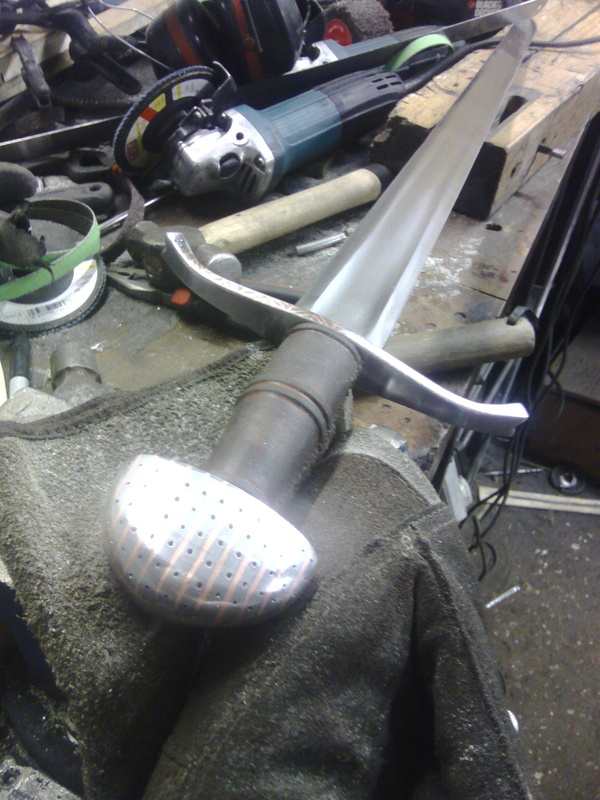 As it is though I had a lot more to do so sadly it was polished off. 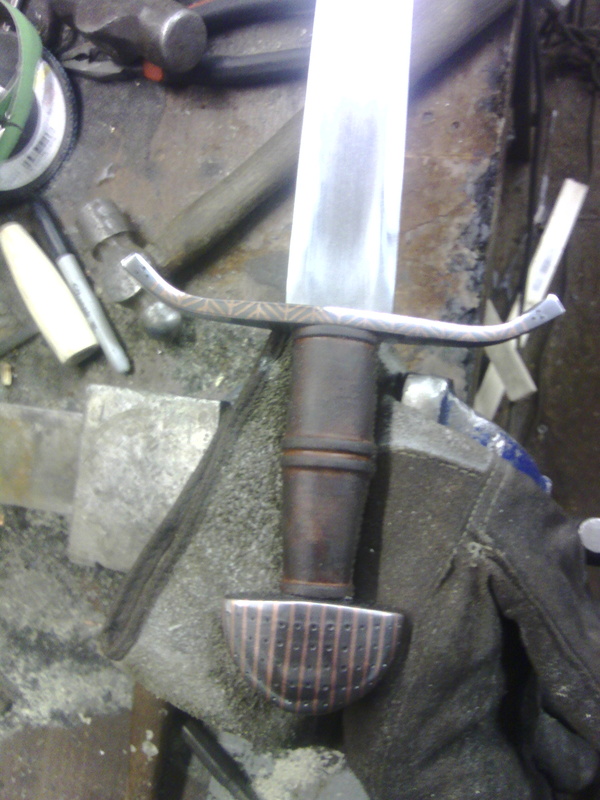 You can see the scale flaking off of the eye where it was hottest. 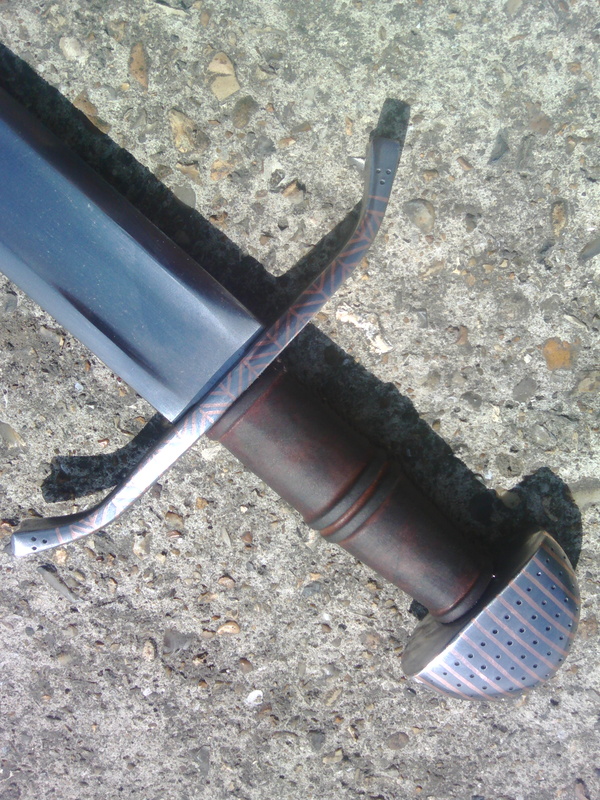 You can also see two lines on the narrow part of the blade. 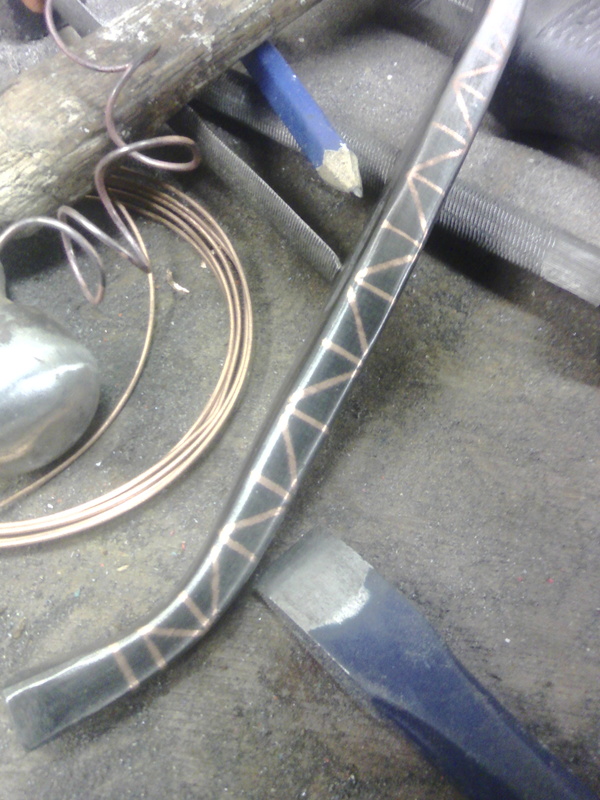 These are channels I have chiselled in order to try out a copper inlay, which will be a new challenge for me! 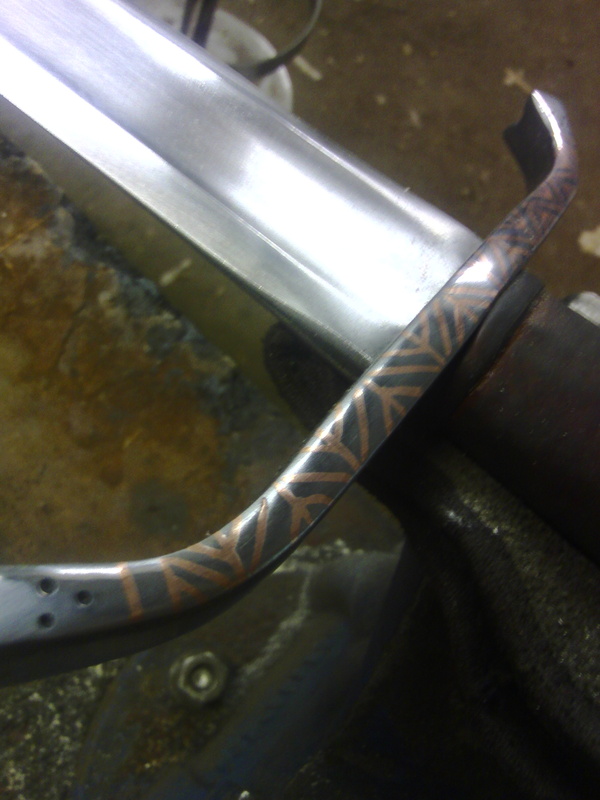 The grooves are first cut with a square graver before being undercut into a “W” shape with a knife graver. 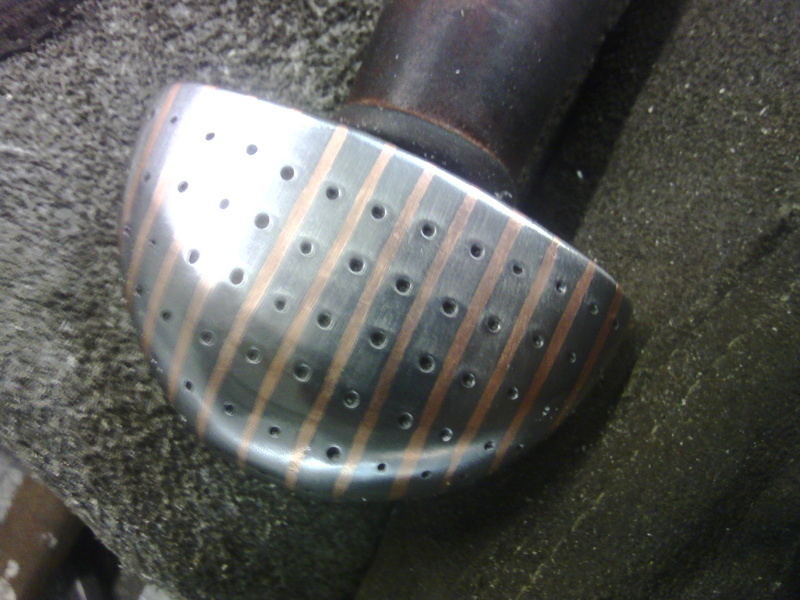 Took a little while, but I want a really strong base for my copper. 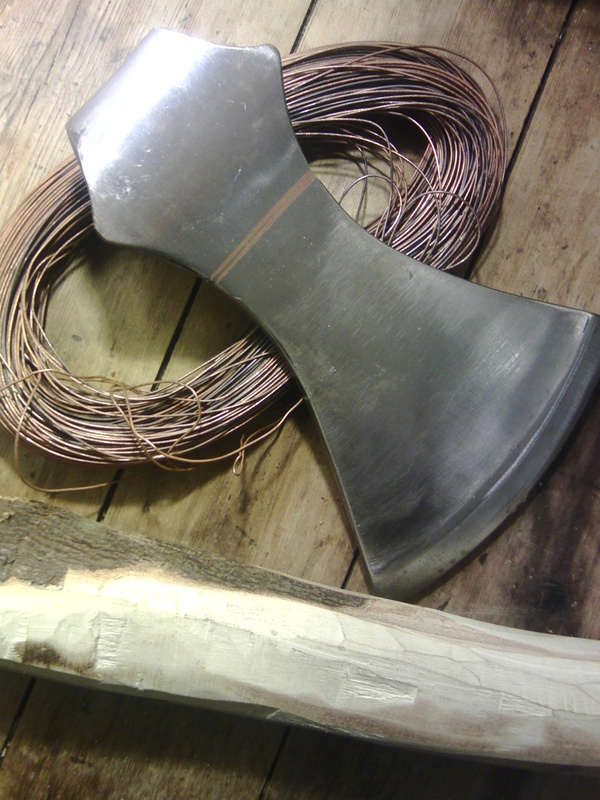 The grooves continue over the top and bottom of the axe and into the eye to help tie off the ends and stop them from getting pulled out during use. 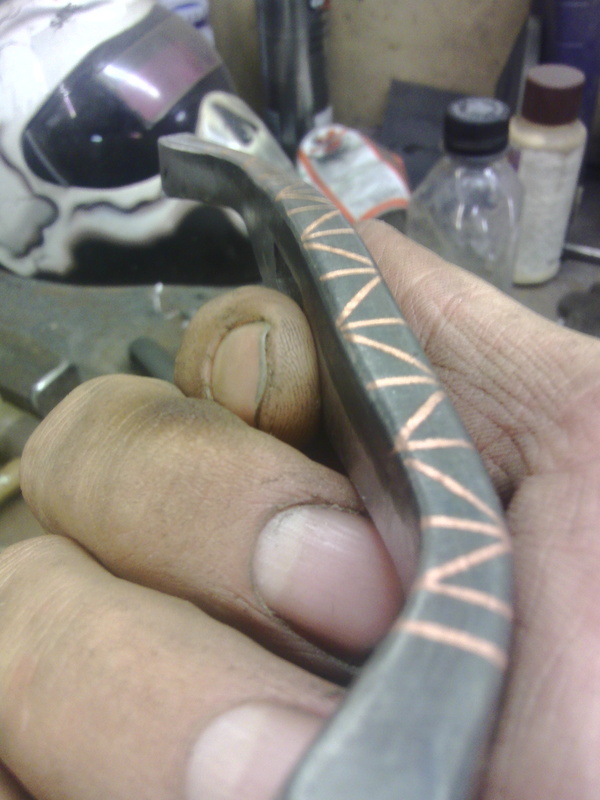 -Possibly try out some etching? 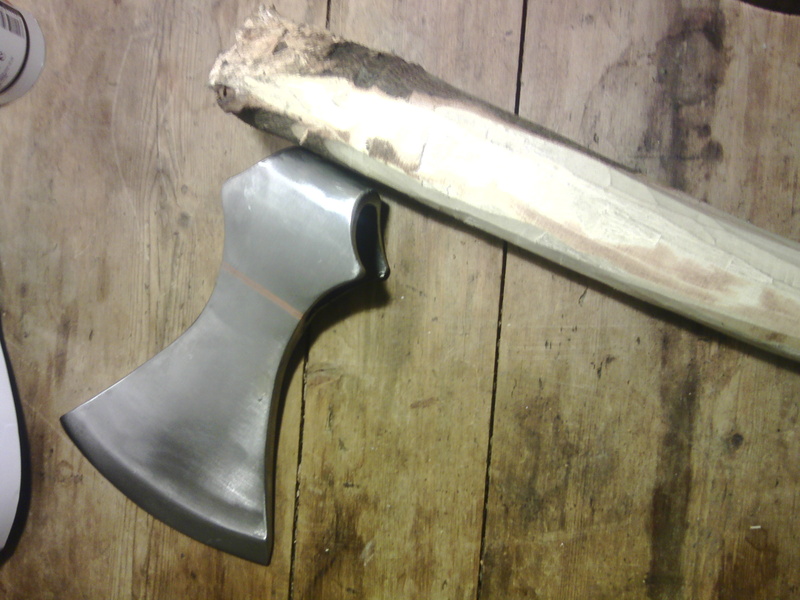 -Make a handle for it, I already have a suitable branch drying. Cant wait to hang it above the fireplace!